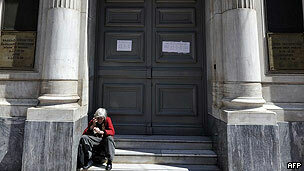 Greece's cabinet has approved fresh austerity measures demanded by the eurozone and IMF in return for a 130bn-euro ($170bn; £110bn) bailout. 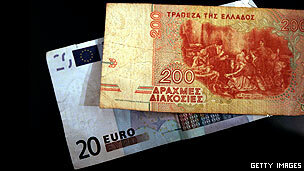 The draft bill must now be passed by the Greek parliament and approved by European finance ministers. Five ministers have resigned from the government over the issue, with one junior party in the coalition saying the demands were "humiliating". Unions began a 48-hour strike on Friday with protesters clashing with police. 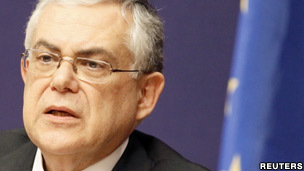 Prime Minister Lucas Papademos has warned the country faces "uncontrolled economic chaos" if it fails to agree spending cuts and defaults on its debts. "We cannot allow Greece to go bankrupt," he told his cabinet, saying it was an "hour of historic responsibility". "A disorderly default would plunge our country in a disastrous adventure," he said. 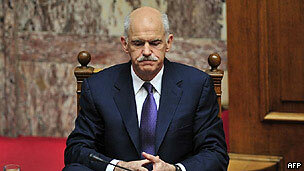 Ministers who disagreed with austerity measures could not stay in the coalition government, the Greek leader added. 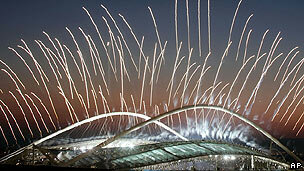 Meanwhile, Greek conservative leader Antonis Samaras has said all his party's MPs must vote in favour of the bailout law. Mr Samaras, whose New Democracy party is a member of the governing coalition, said any rebels would face being dropped as parliamentary candidates. The political fallout from the austerity has begun with cabinet-level resignations. 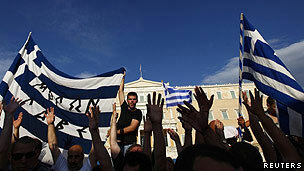 They are symbolically important, showing that solidarity with the cuts at a governmental level has been shaken. Increasingly, Greeks are questioning whether endless austerity is the right approach for tackling Greece's financial woes, or whether a new, pro-growth strategy needs to be adopted. But in practice, the rebellion among coalition members is unlikely to be significant enough to sink the package of cuts in parliament on Sunday. The government still controls a large majority of MPs and the prime minister has warned that dissenters will be thrown out of office. The fear of bankruptcy is still what is driving this government to pursue its painful path, with the prime minister warning of a "catastrophe" unless Greece meets the conditions for its bailout. A default and potential exit from the Eurozone strikes fear into leaders here and throughout Europe. Deputy Foreign Minister Mariliza Xenogiannakopoulou, who quit on Friday afternoon, is the most senior defection so far. 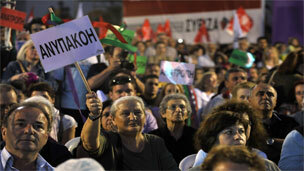 Her Pasok party, the largest in the coalition, also suffered the loss of a deputy labour minister on Thursday. The cuts package will be put to the vote in parliament on Sunday, with some MPs from the governing parties expected to vote against, the BBC's Mark Lowen in Athens reports. But analysts say the package should still have enough support in parliament, because Pasok and its other coalition ally New Democracy account for more than 230 deputies out of a total of 300.
negotiating a debt write-off with banks. These were presented to a eurozone ministers in Brussels on Thursday evening. But they want a further 325m euros in savings for this year and also insist that Greek leaders give "strong political assurances" on the implementation of the packages. An estimated 17,000 union members and communists took to the streets of Athens on Friday, marching to mark the start of a two-day general strike. Protesters also gathered near the parliament building. Some demonstrators threw stones and petrol bombs at police, who responded by firing tear gas. A small number of people from both sides suffered minor injuries. Efi Daridi, a teacher and union member who was protesting, said the results of further cuts would be "tragic". "In schools we didn't have books up to the middle of the school year and not only that - we have children that do not really care about the lessons, because of all the problems at home. "The ramifications in the whole society are immense," she told the BBC. The country is already reeling from the effects of an earlier round of austerity that followed a previous bailout - it is deep in recession, with unemployment rising above 20%.